This time around the illustrations are provided by a fellow named Gary Chatterton. He takes the series of a books to an amazing new level with the life-like illustrations are simply amazing. If nothing else, just crack the spine of this book to admire the art work. 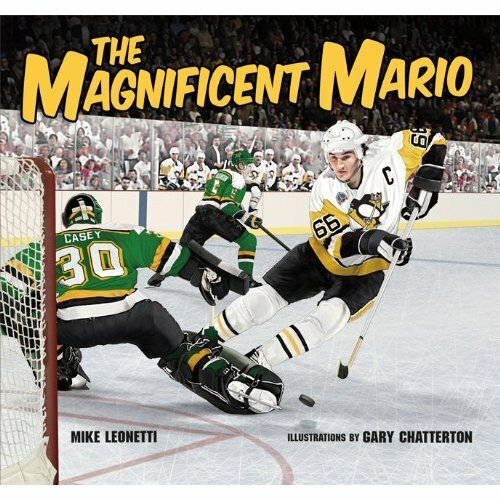 Product Description: A young hockey player learns the value of playing one's best — no matter what the circumstances — from real-life hockey hero Mario Lemieux! About the Author - Mike Leonetti has written numerous books for both children and adults about the good ol' hockey game. His current picture book series with Scholastic is about hockey heroes and includes titles such as Wendel and The Great One, The Rocket, and The Mighty Tim Horton. A lifelong Toronto Maple Leafs fan, Mike lives in Woodbridge, Ontario, with his wife and son. Gary Chatterton's incredibly life-like illustrations have appeared in advertising campaigns for major corporations such as Molson Canada, Labatt, Bell, and the Biodome de Montreal. Gary lives in Beloeil, Quebec. Interested in this title? Previous history-themed children's titles by Leonetti include The Mighty Tim Horton, Wendel and The Great One, Maple Leafs A-Z, Gretzky's Game, The Greatest Goal, The Goalie Mask, Number Four, Bobby Orr!, A Hero Named Howe and My Leafs Sweater.